Despite the DD-WRT partnership with Buffalo hardware and the stunning endorsements, the router is really disappointing compared to my previous Linksys WRT54G. If you bother to trawl the DD-WRT forums several threads talk about how unstable and disappointing V24-SP2 build 14998 DD-WRT (Professional) firmware is. My own post on the Buffalo forum goes un-answered, and contacting Buffalo directly is a sad redirect to (ref: 107218) http://www.dd-wrt.com/phpBB2/ for support. This sadly seems to be some poor execution and followup by Japanese Buffalo. Firstly you need someone with a clue answer people's questions on the DD-WRT forums if you won't support DD-WRT on your Buffalo forums. 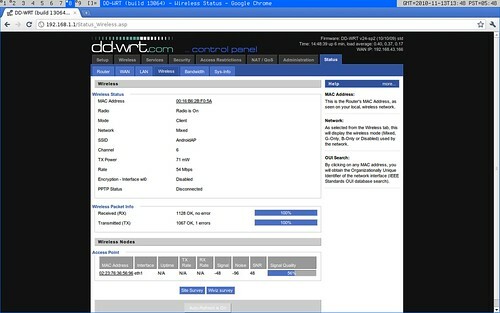 The "professional" DD-WRT is hardly niche, it's ironically far easier to use than the default "stock" firmware.